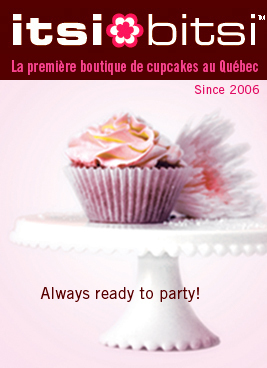 Itsi Bitsi the first cupcake boutique in Quebec since 2006. Our cupcakes are made on site and we use only real butter! Since 2006, our original Montreal concept boutique specializes in cupcakes, homemade gelatos and gifts. Enjoy our selections in the cozy atmosphere of our shop, take them to go for the perfect dinner-invitation in our unique style gift box or to enjoy at home with your friends and loved ones. You can also place an order for your next corporate event. Since our beginning 6 years ago we have been using REAL BUTTER AND NO FOOD ADDITIVES. ** All our cupcakes may contain traces of nuts. Do all your shopping at Itsi Bitsi. Lots of gifts for everyone! SABRE, Tabletop from PIP Studio, Love & Toast bath products, Mugs from Pantone, tabletop Shinzi Katoh, dolls from BLABLA, blankets from David Fussenegger, AVOCA knits, Dolls Super Zeros and more! TM: itsi bitsi and the flower are trademarks of itsi bitsi cake inc. all rights reserved. All images and content on this web site belongs to Itsi Bitsi. You may not use any content without our permission.